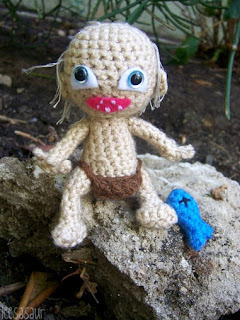 Gollum is my favorite character from Lord of the Rings, so my eyes lit up when my terrific client, Jeff, commissioned me to make one for his girlfriend's birthday. He let me run free with the design, so I was really excited. 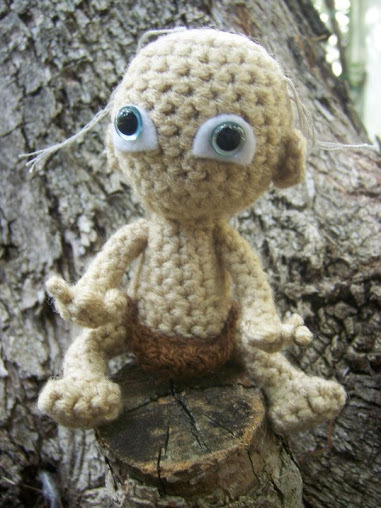 To begin, I didn't know what size to make Gollum, but ordering pretty 9mm hand-painted eyes, kindof determined that for me. I wanted his eyes to be the big happy ones, and because the eyes I had were not very large to begin with, the rest of his body proportioned its tiny self accordingly. I love singing 'Rock and Pool,' so I wanted to accompany him with a fish for some quality Smeagol time. I inserted a magnet in his face, and attached a wire to the fish, so you can play out the scene! After establishing the head, I spent a ridiculous amount of time getting his loins just right. I ended up splitting yarn and using various stitching techniques around. I gave him frail fingers so that you could put a ring on it! 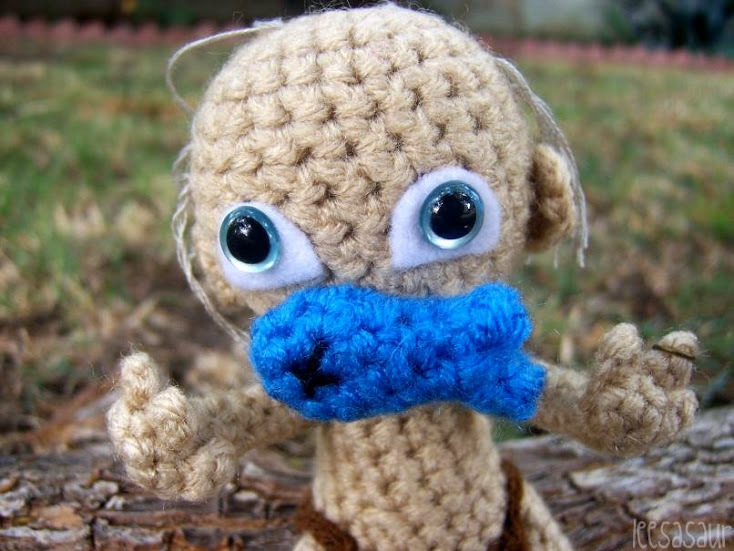 He comes with a tiny gold loop so you can decide if he's Gollum or Smeagol! I finally had my first struggle after-touch. After I finished everything, Jeff really wanted me to add a mouth displaying Gollum's "jacked up teeth." 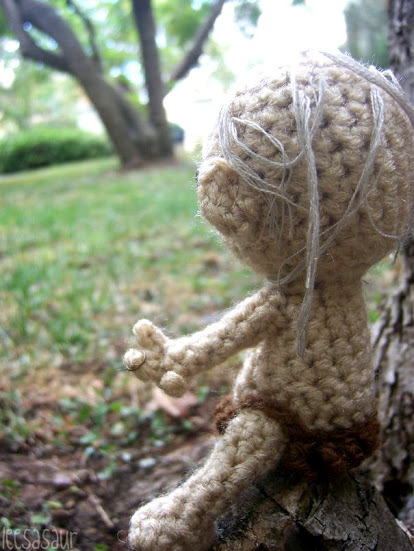 I tried several different methods with yarn, but then ended up using felt. I tried to make the mouth magnetized too so that it was removable, but that didn't work, so I had to glue it on. It was a frustrating task because I didn't envision him with a mouth, and as you may have noticed, I don't tend to give my characters mouths. 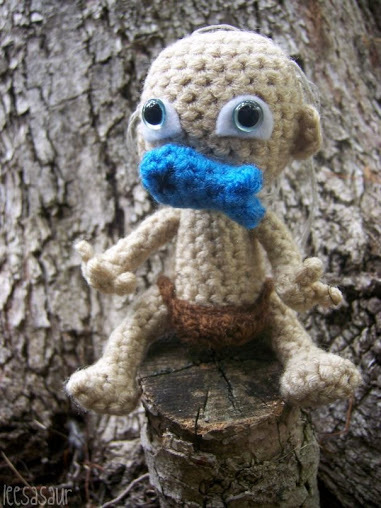 But after all the effort, I realized the big reason was that I didn't want him to have a mouth, because I had grown extremely attached to him. He became my precious. Of course, the client gets what he wants, so Jeff got his mouth! I'm very happy because he is still adorable with it, and the fish actually ends up covering his mouth when it's on his face. In addition, Jeff's girlfriend will have the stylized one-off Gollum catered to her, so what can be more special than that? Anyway, I am totally in love with him, and can't wait to order more eyes so I can have my own. 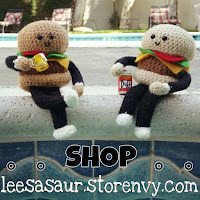 For future reference, if I decide to make these available for sale, they will come without a mouth! 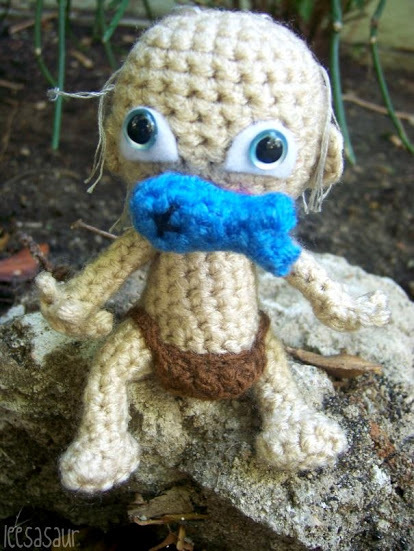 Would you be willing to share the pattern you used to make Gollum? I design all my patterns and unfortunately, do not write any of them down.